MELBOURNE—In a bold and politically risky move, Australia’s Labor Party government on July 10th unveiled details of a Clean Energy initiative that would impose a tax of AU$23 on each metric ton of carbon dioxide emitted by 500 of the country’s biggest polluters, most notably coal-fired power plants that produce 77 percent of the country’s electricity and iron and mineral mining companies that account for 35 percent of Australian exports. Prime Minister Julia Gillard, who at the moment appears to have barely enough votes in Parliament to get the plan through, confidently predicted, “This is going through, this is done, full stop.” However, with her popularity rapidly slipping in opinion polls and industry opposition to a carbon tax increasing, Gillard will have a fight on her hands to swing public opinion her way and keep her fragile parliamentary coalition together. Meanwhile, as a slowly but steadily growing number of countries around the world are turning to government imposed carbon taxes, or to market-based emissions trading schemes, some environmentalists in the United States are looking again to those programs as a way of reducing the greenhouse gases that many scientists believe are causing global warming. A carbon dioxide emissions trading bill introduced by Rep. Henry Waxman (D-Calif.) was passed by the House in 2009 but died in the Senate. The Republican gains in the 2010 mid-term elections and the effects of the recession have further reduced chances of the proposal being resuscitated any time soon by the Obama administration. Ironically, it was the United States under President George H.W. Bush that started the world’s first emissions trading system in the 1990s to reduce sulfur dioxide and nitrous oxides that were causing acid rain. By 2007, the program had reduced SO2 emissions by 50 percent from 1980 levels and it was hailed as the greatest accomplishment of the Clean Air Act amendments of 1990. Yet there still is no nationwide carbon dioxide-specific tax or cap-and-trade emissions program in the United States, and considering the low industrial growth and high rate of unemployment—not to mention the anti-tax fever generated by the Republican Party and the Tea Party movement—it seems unlikely that a carbon emissions trading measure similar to one that was passed by the House in 2009 would stand a chance. None of the current GOP presidential hopefuls is likely to ever support a carbon tax or emissions trading plan, particularly since Senate Republicans launched an effort to strip the Environmental Protection Agency of authority to cap carbon emissions. It was not always so; Republican Sens. John McCain (AZ) and Lindsay Graham (S.C.) once co-sponsored cap-and-trade legislation, and current or former presidential candidates who previously supported emissions trading include former Minnesota Gov. Tim Pawlenty, former House Speaker Newt Gingrich and former Massachusetts Gov. Mitt Romney. Pawlenty recently went so far as to apologize for his past support of cap-and-trade policy. A carbon tax is a direct governmental levy on a business’s emissions of greenhouse gases, specifically carbon dioxide, above a set limit, or cap. The regressive nature of carbon taxes often are offset by tax breaks or other subsidies favoring low-income groups most affected when firms pass the tax on to the consumer. It is common for a straight carbon tax to evolve into a cap-and-trade, or emissions trading, policy. Emissions trading is a market-based approach used to control pollution by providing economic incentives to businesses for achieving reductions in the emissions of pollutants. A government sets a limit, or cap, on the amount of a pollutant that can be emitted. The cap is allocated or sold to businesses in the form of permits to emit a specified volume of the pollutant. The total number of permits cannot exceed the cap, and to stay within the limits firms can purchase permits from domestic or overseas firms that require fewer permits. The price of the permits is set by the marketplace. Q. How would Australia’s carbon tax work? If enacted, Australia’s “Clean Energy Plan” will set a carbon tax of AU$23 (U.S.$24.64) per ton of carbon dioxide emitted starting next July 1 to be paid by Australia’s 500 biggest polluters, rising by 2.5 percent a year until it moves into a full emissions trading program in 2015. (Unless specified otherwise, all money figures are in Australian currency). At that point the market will set the price of carbon emissions and emission credits, and by 2020 carbon pollution is expected to be cut by 160 million tons, which is the equivalent of the total emissions of 45 million vehicles. The carbon permits part of the plan is based on the global theory that because greenhouse gas emissions move around the earth at high altitudes, it doesn’t matter where emission reductions take place as long as fewer greenhouse gases enter the world’s atmosphere. As businesses lower their pollution output, the price they pay for permits is less, which the government says will be an incentive for them to make their plants more energy efficient. The greenhouse gases target for 2050 will be increased to 80 percent fewer emissions than the 2000 levels. The current target is 60 percent below the 2000 mark. The government will compensate affected industries for $9.2 billion over the first three years, including $5.5 billion earmarked for upgrading coal-fired power plants that are not closed down; $1.3 billion for coal mines to target high methane emissions and an additional $1.3 billion for creating jobs at the mines most affected by the carbon tax. In addition, export industries with the highest emissions, such as steel, aluminum and pulp and paper makers, will initially get free carbon permits to help them through their pollution abatement period. The government will buy out and close down the worst coal-fired power plants, which in total have an output capacity of 2,000 megawatts of electricity. The plants weren’t identified, but they are likely to include the controversial Hazelwood power plant in the Latrobe Valley east of Melbourne, which is regarded by many environmentalists as one of the world’s worst polluters. A $10 billion Clean Energy Finance Corporation will be established to invest in new energy technology. Also, $3.2 billion is earmarked for the Australian Renewable Energy Agency. Fuel for most business and personal transportation is excluded from the carbon tax, but owners of heavy transport vehicles will start paying the tax in 2014. The government originally planned to impose a carbon tax on automobile fuel but later decided it would be a politically risky issue. Domestic aviation fuel taxes will be increased by an amount equal to the carbon tax. Agriculture is not subject to carbon pricing. Q. How will Australia soften the economic impact of carbon taxing? Like most countries with carbon taxes, especially those in Europe, Australia will adopt what critics of the plan call a “Robin Hood approach” and redistribute part of the carbon tax revenue from the big polluters to households that will bear the brunt of the economic impact. Because the industries will inevitably pass on the carbon tax to consumers, the cost-of-living for the average household is expected to rise by $515 a year, according to government estimates. However, more than half the estimated $17 billion revenue raised by the tax will be used to compensate households by way of tax cuts and increases in pensions, allowance and family subsidies. As a result, average household assistance will be $525 a year. Every taxpayer with an income below $80,000 will get a tax cut beginning in July of next year. An extra 20 percent in benefits will be given to old age pensioners. Recognizing that it would be unlikely to win public opinion over to the plan without such generous payouts, the government has been trumpeting the compensation part of the plan as a “net gain” for most households. Q. How does Australia’s carbon emissions output compare to other countries? The government’s bipartisan Climate Change Commission said in its recent report, “The Critical Decade,” that 2001 to 2010 was the worst decade on record in terms of climate, with Australia’s Bureau of Meteorology and Commonwealth Scientific and Industrial Research Organisation (CSIRO) predicting more frequent extreme weather events such as droughts, heat waves, bushfires, cyclones and floods. The Climate Change Commission says global warming could cause the sea level to rise by one meter by the end of the century—higher than previously thought. Even though it has a population of only 22 million people, most of whom live in a half dozen coastal cities, “the Lucky Country,” as it is called here, has always been ranked high on lists of the world’s top carbon emitters. The most recent list collected by the U.S. Energy Department’s Carbon Dioxide Analysis Center put Australia in 12th place for overall emissions tonnage among more than 200 countries. A 2009 British emissions study put Australia at No. 1 on a list of the world's highest per capita emitters of carbon dioxide emissions from energy use, saying the annual output of 20.58 tons per person here had surpassed the United States with 19.78 tons per head. Thirty-two countries have carbon trading plans and 10 have a carbon tax, while a total of about 85 countries have renewable energy targets. Europe is the most active part of the world for mitigating greenhouse gases, with the European Union operating a collective emissions trading program and at least 13 countries individually imposing a carbon tax. They include Denmark, France, Finland, Germany, Italy, the Netherlands, Slovenia, Sweden, Switzerland, and the United Kingdom countries (England, Scotland, Wales, and Northern Ireland). The costs of most carbon taxes per ton of emissions in Europe are in the same neighborhood as Australia’s. Q. Who are Australia’s biggest greenhouse gas polluters? Answer: Electricity generating companies, by far. Nine of the top 10 carbon dioxide emitters on a list published by the government’s Greenhouse and Energy Data Officer in March were power companies, and of the next 10 highest emitters, 5 are also power companies, reflecting Australia’s reliance on coal for 80 per cent of its power generation. Other heavily exposed sectors are steel, zinc and aluminum mining, refining, smelting and manufacturing operations (Rio Tinto Ltd., Alcoa Australia and BHP Billiton are among the top 20) and pulp and paper manufacturers. The iron and mineral mining companies in Western Australia play a dominant role in Australia’s economy, largely as a result of China’s voracious appetite for ore for its steel and aluminum plants. When the carbon tax goes into effect all mining companies are expected to take a financial hit, even after offsetting government compensation. Particularly vulnerable are the coal mining regions around Newcastle, north of Sydney, and the Latrobe Valley east of Melbourne, where brown coal is extracted from mines on the same site. 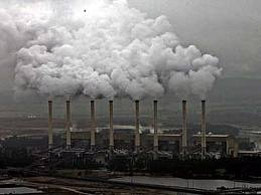 The huge electricity generating plant with multiple exhaust stacks can be seen belching carbon-laden smoke around the clock. The economies of those and other coal mining regions are heavily dependent on coal mines and power plants, and much of the opposition to Gillard’s emissions plan is coming from those areas. Even though it produces only 6 percent of the world’s coal, Australia is the world’s largest coal exporter, with Japan’s steel mills and power plants accounting for 104.8 million tons a year, or 40 percent of Australia’s coal exports, followed by Korea (16 percent), and Taiwan, China and India with 10 percent each. All of those coal markets are high on the list of the world’s worst carbon emitters, which puts Australia in the unenviable position of being not only a polluter itself, but an indirect source for some of the worst carbon emissions elsewhere. According to Friends of the Earth Australia, the 270 millions tons of coal that Australia exports annually overseas equates to around 730 million tons of CO2, or about one-fifth more greenhouse pollution than is currently emitted within Australia's borders. Q. Who is opposing Australia’s proposed carbon tax, and why? Tony Abbott, the leader of the conservative Liberal Party coalition in Parliament, called Gillard’s plan “redistribution pretending to be compensation. It’s a tax increase pretending to be an environmental policy. It’s socialism masquerading as environmentalism.” Abbott assailed Gillard and her Green Party coalition partners for forcing Australian businesses to spend more than $3 billion a year purchasing carbon credits abroad. The government, he said, was going to collect $17 billion in carbon taxes while increasing its spending by $21 billion. He said that under his party’s “direct action” energy plan, which is based largely on incentives for businesses to encourage more voluntary pollution reduction, plus government programs to boost investment in alternative technology, would reduce emissions to the same level as the government’s target. Abbott predicted the Labor government will suffer the wrath of voters when Australians realize they will not be better off with a carbon tax. He said the next election, which must be held by November, 2013, would be, in effect, a referendum on the carbon tax. But he suggested public outrage could reach such a level that an erosion of Gillard’s razor-thin majority in Parliament could lead to her coalition being unable to command confidence of the House of Representatives, which could trigger a dissolution of Parliament and an election before the scheduled 2013 polling date. Industry reaction to the carbon tax has also been swift and negative, with companies warning of higher prices, loss of jobs and stunted economic growth. Minerals Council of Australia chief executive Mitch Hooke said the mining industry expects to suffer a $25 billion “hit” and lose 20,000 jobs by 2020 as a result of the tax. “The only way in which you will reduce methane emissions in coal mines is to close them down,” he said. The Australian managing director of Rio Tinto mines, David Peever, called the tax “unfair” and warned it would hurt Australia’s export sector. Joining the anti-carbon tax campaign, the coal industry took out full page ads in the national press, warning, “No other major coal exporter has a carbon tax. Not one.” The Australian Coal Association warned that coal exporting rivals South Africa, Canada and Indonesia take Australia’s share of the market. The world's leading energy suppliers will achieve through international'environment' standards, rules and regulations a world-wide domestic dependance on centrally owned energy sources - ie electric and natural gas. Domestic programmes offer short term incentives and long term debts and inconveniences. The level of junk science BS in the UNFCCC, EPA International and their Lung Association friends is phenominal. All to put a price on a fundamental element of life - carbon. All part of George Bush Senior's 'Big Idea'.